Spawn travels to Gotham City to search for pieces of his broken life. There he learns of the apparent resurrection of a man (Simon Vesper) whom he had killed years ago as Al Simmons. Batman is also investigating the return of this man whom he saw killed. 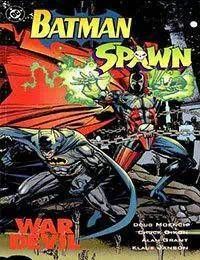 Spawn meets batman and assumes he is a demon sent to kill him, But Spawn is unable to harm Batman. After a brief fight the two team up to stop Simon Vesper from harvesting the souls of Gotham to add to hells army.